As a child I was mesmerized by the vivid colors of tulips, lupines, delphiniums, and oriental poppies. I planted with enthusiasm, certain my little garden border would be bright and colorful all season long. That enthusiasm was soon squashed a week or so later when the petals dropped and all that remained was nondescript vegetation. I was left puzzling how one was go about achieving the bright, lushly-planted gardens pictured in my favorite glossy gardening magazine? 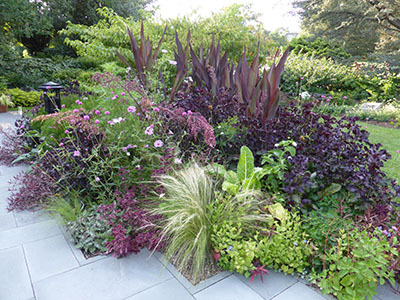 Color is a topic many gardeners have broached. From Gertrude Jekyll to Christopher Lloyd, all have shared thoughts, theories, and ideas. While there are tomes dedicated to color theory and planting, one valuable lesson I’ve learned for having reliable color is to look not at flowers, but rather foliage. Leaves are vital to a plant’s overall functionality and are thus present throughout most of the growing season. Now imagine if these leaves were in shades of red, purple, yellow, and orange? 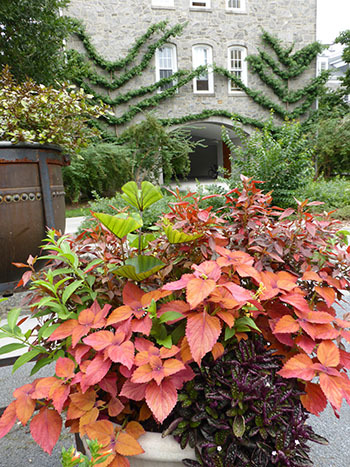 Annuals and tender perennials, often dubbed “tropicals” allow a gardener to experiment. Tropicals are relatively cheap investments that allow visual fluidity in the garden. One year’s orange color theme could give way to pastels the next. Such creativity and change is part of the fun in gardening! Acalpypha is a member of the spurge family (Euphorbiaceae) that thrives in the hot, humid eastern Pennsylvania summers. Depending on the cultivar, leaves range in color from rusty orange to red, gold, and yellow. Plants perform well when planted in the ground or in containers as long as full sun is provided. 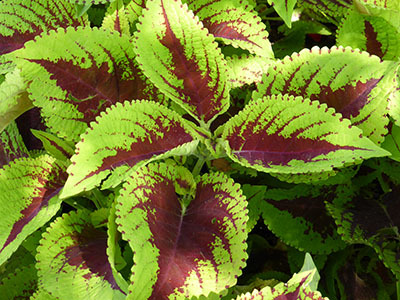 Alternanthera provides similar coloration found in Acalypha but in a more finely textured, compact presentation. Alternanthera ‘Partytime’ with its green leaves awash with streaks of hot pink is a personal favorite. Alternanthera ficoidea ‘Red Thread’ sports deep burgundy leaves making it an ideal container or front-of-the-border addition. 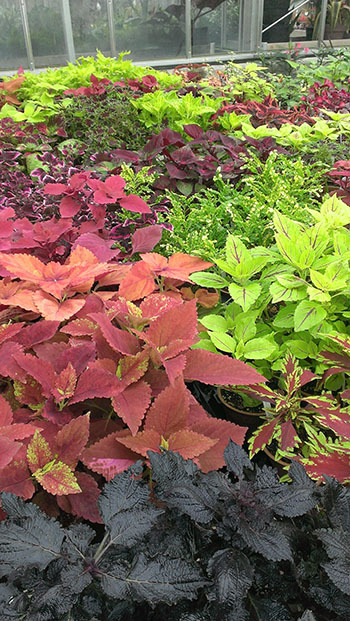 Solenostemon, more commonly known as coleus, has come a long way in the past decade. Long gone are the mixed assortments of seedling-grown plants that quickly go to flower. 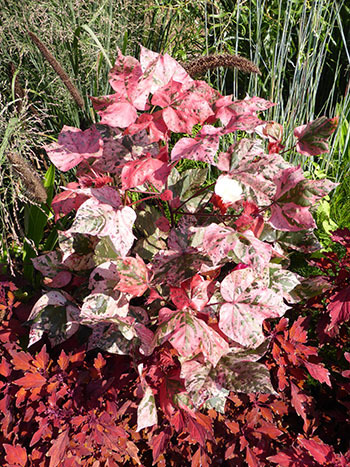 Improved cultivars provide striking foliage, which often becomes more magnificent in size and coloration with age. 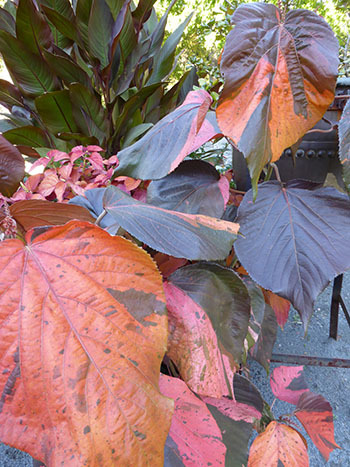 ‘Bryce Canyon’ has vibrant peachy-orange leaves. ‘Religious Radish’ bears pinkish-red foliage with dark purple markings down the mid-vein. 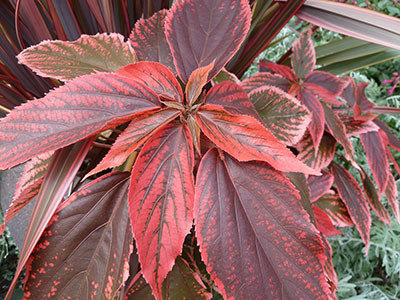 A personal favorite, ‘Smallwood’s Driveway’ is a kaleidoscope of warm colors on unique whorled fan-shaped leaves. Looking for gray foliage plants? Look no further than the genus Dichondra and Dicliptera. 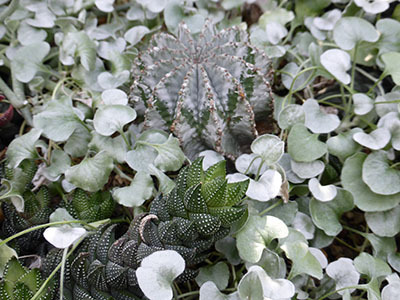 Dichondra argentea ‘Silver Falls’ is a cascading, ground covering powerhouse. Plant in a hanging basket or container and in no time the silver clad plant will be clambering to the ground. The creeping stems are covered in small, fuzzy, mouse ear-like leaves. Dicliptera suberecta bears felty blue-gray leaves. Orange tubular flowers are a guaranteed hummingbird magnet. Cissus discolor is otherworldly. 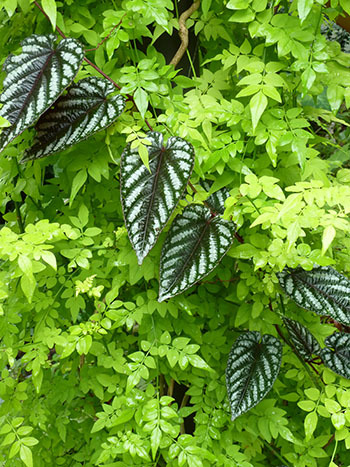 The rex begonia vine bears elongated dark green heart-shaped leaves washed in iridescent metallic patterns. Delicate tendrils help the vine climb up and over. Provide shade and give this plant some time – it can be slow to start. Once it gets a foothold, watch out and be prepared to marvel. Oxalis spiralis ‘Plum Crazy’ is too charming. 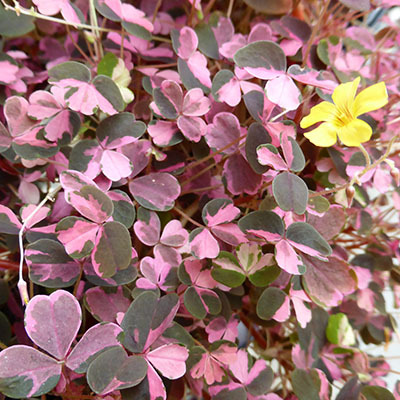 Dainty dark purple clover-like leaves are splashed with bright pink markings. Yellow flowers bloom throughout the year. This plant is ideal where it can be observed up close. Perhaps you only have room on the patio for one mixed container – Oxalis ‘Plum Crazy’ is a perfect plant for such a space. As an added bonus it makes a great, easy- to-care-for houseplant. Arboretum Volunteer Eve Thyrum has compiled an extensive and thoroughly researched sale catalog highlighting the offerings at the 2015 Unusual Tropicals and Annuals Sale. Feel free to download, browse the offerings, and use the manual as a point of reference. 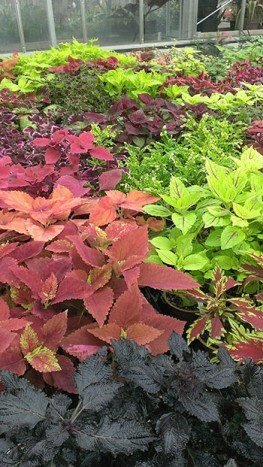 From Canna to Colocasia and begonias to bromeliads, there is bound to be bright foliage aplenty at the Unusual Tropicals and Annuals Sale on Saturday, May 16. Hope to see you there!